Our wonderful wee school is located in the heart of Stirling city center, and serves a uniquely diverse catchment, with some of our learners coming from areas of high deprivation (decile 1) and others from significantly more affluent areas (decile 10).In total, one-third of our school community live within the areas of highest deprivation in Stirling. It has been widely reported that with the rapid development of technologies, many of our learners will be leaving the education system to work in careers which do not yet exist. As an inner-city school, we are passionate about ensuring that our children develop the necessary skills to equip them for success in a continually developing world - in particular, their digital skills. For many of our learners living within the lower decile areas, school is the only place where they can access the diverse range of technologies needed to develop such skills. Currently, our middle to upper school only have access to 10 Chromebooks, 7 laptops and 5 desktop computers, which is not enough even for a class set. We desperately want to change this! Through transforming our currently unloved break-out space into an inspiring 21st Century Digital Den, equipped with a variety of high-quality technologies, including Chromebooks and a 3D printer, we are aiming to create a relaxed space where children can collaborate, explore and develop their digital skills. Our Chromebooks and 3D printer would be housed in a Digital Den Break-Out area and accessed by children from Primary 4 - 7. 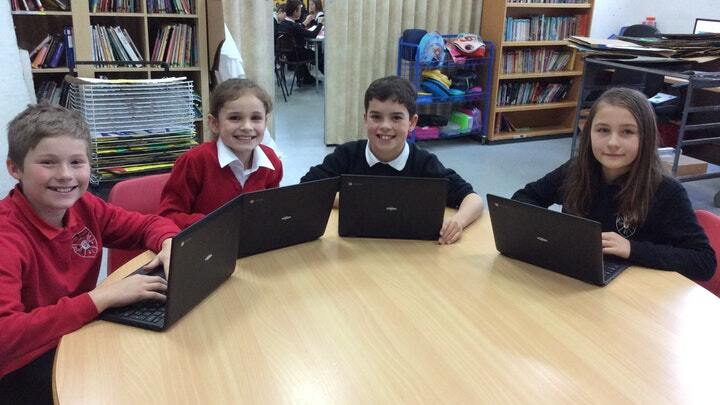 Increasing the number of Chromebooks we have as a school will allow for every child to work from their own device. This will ensure that no child is simply sitting 'watching' others using the technology, but are actively involved. We have seen first hand how use of Google Classroom can enhance engagement and collaboration, through children developing skills to create shared documents and work on these together from separate devices. Through using the Chromebooks, children develop skills to enhance learning across all curricular areas, from creating collaborative presentations in Social Studies, to navigating through Online Treasure Hunts in Science. Furthermore, using technology allows our learners who require additional support to edit their work easily, as well as accessing editing and drafting tools which allow them to listen back to their writing, and check that it makes sense. Currently our school is developing a Maker Space mentality, and we are keen to develop opportunities for children to collaborate in creative design tasks, allowing them to problem solve, explore, evaluate and adapt. Children's enthusiasm for, and skills in, creative problem solving will develop through the use of innovative technologies such as a 3D printer - because they'll be bringing their designs and ideas to life!